Diploma Govt Jobs for all Indian candidates under National Thermal Power Corporation of India. NTPC is a Government of India Limited company; which is looking for fresher Indian candidates who have an engineering diploma in various streams. There are total 362 vacant Diploma Engineer posts which are going o be filled up through NTPC Recruitment 2018. Engineering jobs in India is very hard to get this time; this one is a great opportunity to all Indian who are in search of Diploma Govt jobs. Those who are interest for NTPC vacancy can apply online through the NTPC Official web link. Descriptive detail related to these Diploma Govt Jobs is given below in the same article. Read the whole article partially before applying for this NTPC Recruitment 2018. NOTE: If you miss any particular information related to this NTPC Vacancy we advice all reader to must go through the Official Notification. Below in IMPORTANT LINK section we share the direct link of Advertisement related to these Diploma Govt Jobs. 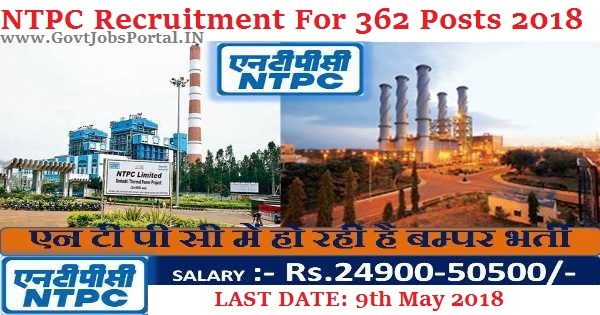 Number of Vacancies: NTPC Recruitment department is looking to fill up 362 vacant posts through this NTPC Recruitment process. Age Bond: Applicants age must be less than 25 years for applying these Engineering jobs. Education Criteria: Those who are wishing to apply for these Diploma Govt jobs must have a completed Full time regular diploma in the respective stream. Final years student in diploma course are not eligible to apply; only pass out candidates can apply for this NTPC Vacancy. How much is the Application for to Apply? This is the very common question in every recruitment process. For this NTPC Recruitment process candidates belonging to the Gen/OBC Category have to pay Rs. 300; While students belonging to the SC/ ST/ PwBD/ XSM Category need not to pay anything to apply for these Diploma Govt jobs. Candidates who are going to apply for these Diploma Government jobs in India will be selected on the basis of their performance in 2-Tier Examination. NTPC Recruitment department decided to conduct 2-Tier of examination for the selection of candidates. The test is going to be ONLINE. SATGE1: The stage one of selection process is TIER-1 Online Exam. First tier of the examination will be a APTITUDE Test containing English, Quant aptitude and reasoning. You have total 120 Min. to solve this online Test. STAGE2: The stage 2 for this NTPC Recruitment is Tier-2 examination. This is an online Technical skill and knowledge test for the respective discipline in diploma course. Candidates will get 2hr. to solve this online technical test based on their technical knowledge. How to Apply For This NTPC Recruitment? In today’s world everything is online; the process for applying these Engineering jobs in India is to apply online through the official department website. Check the IMPORTANT LINK Section for the official link to apply online. There is no other way to apply for these Engineering job under NTPC Department. 18th April 2018 is the Starting Date to apply. 9th May 2018 is the Last Date to apply online.